The 24.2MP D3300 is the latest incarnation of Nikon’s entry-level DSLR, aimed at beginners who are new to DSLRs and want to take their photographic skills to the next level. It comes nearly two years after the release of the hugely successful D3200, which was Nikon’s best-selling DSLR in 2013, accounting for a whopping 15% of all DSLR sales in the UK, and 10% worldwide. Nikon hasn’t revolutionised the exterior of the D3300 body, giving it an almost identical size, shape and button layout to the D3200. In fact, there are so few differences that it’s difficult to tell the two apart. While it’s no smaller, the D3300 is lighter by 43g, making it the lightest Nikon DSLR ever, albeit only by the weight of a Cadbury’s Twirl. But while the body remains largely unchanged, the 18-55mm kit lens has been through an extensive redesign, and is now 25% lighter and 30% smaller in volume than its predecessor. Not only is it significantly thinner, but it has a retractable lens barrel that takes 17mm off its shortest length for easy transport and storage. The inside of the camera has seen some significant tweaks too. At its heart is the upgraded EXPEED 4 processor, which is the same as the one in the enthusiast-level D5300 and the newly announced pro-level D4S. This allows fast, smooth camera operation, and improves performance in areas such as noise response and battery life. In fact, this camera can manage 700 shots from a single charge. That’s 150 more than the D3200. 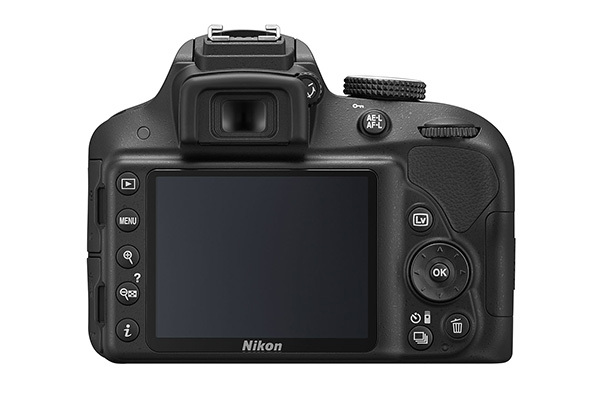 The 24.2MP CMOS sensor remains unchanged, though Nikon has removed the optical low-pass filter for sharper shots. Built into the D3300 is a 3in 921k-dot screen with a viewing angle of 160°. While it’s exactly the same screen found on the D3200, it does boast double the resolution of Canon’s new entry-level model, the 1200D. Colour rendition and sharpness are good and the contrast reasonable, though blacks are a little milky. The screen is fairly easy to see in bright conditions, however many users will be slightly disappointed with the lack of flip or tilt functionality, and also that the LCD isn’t touch-sensitive. The Canon 700D, for example, offers a flip-out touchscreen, and at the time of print is cheaper. Unlike on the more advanced D5300, the screen is in a 4:3 ratio, so when reviewing and composing, the image doesn’t take up the full 3in screen. When using the menu or zooming in for image review, the whole screen is used. As is the case with all Nikon entry-level DSLRs, there is no focusing motor built into the D3300 body, so be aware that only modern AF-S lenses, which have a focusing motor of their own, will autofocus. This accounts for almost all current lenses, though if you want autofocus on a lens such as the 50mm f/1.8 D AF, you’ll need a more advanced body like the D7100. The D3300 uses fast phase detection focusing with 11 AF points and one cross-type point in the centre for greater accuracy and speed. In testing the camera focused quickly and rarely hunted, even in low light conditions. For close-up subjects, there is an AF assist light. Autofocus is also available in Live View, though this is far slower as it uses contrast detection. The D3300 has a native ISO range of 100-12,800, extending to 25,600, which is slightly better than the D3200. You’ll find our ISO test results opposite this page. As well as improved ISO, the D3300 has a faster shooting speed of 5fps, which is quite impressive for an entry-level camera. It beats the D3200’s 4fps and the Canon 1200D’s 3fps, so is better suited to photographing fast-moving subjects like children, pets and sporting events. In testing, the camera shot around eight RAW images at 5fps before the buffer filled up and the shooting speed slowed down. In large JPEG mode it managed 18 images. As on all Nikon DSLRs, the D3300 has an optical viewfinder, which on this model gives 95% frame coverage. It boasts a slightly improved magnification of 0.85x, meaning the viewfinder display is slightly larger than before. For shooting close-up subjects in low light, the D3300 has a built-in flash with a very respectable guide number of 12. Alternatively, of course, an external flash can be mounted on the camera’s hotshoe. Many will be disappointed that Nikon has not built Wi-Fi into the D3300 as it did into the new D5300. However, it is wireless-compatible using the WU-1a Wireless Mobile Adapter that plugs into the external connections port. This dongle allows picture sharing via a smartphone device, as well as remote camera control including Live View, and it can be purchased for £48. New to the Mode Dial is an Effects mode which includes a new Easy Panorama mode, as well as Selective Colour, Toy Camera and Photo Illustration. The thumb dial allows easy effects selection, and they work for photos and video. Unlike Nikon’s previous entry-level DSLRs, the D3300 is available in grey and red as well as black. 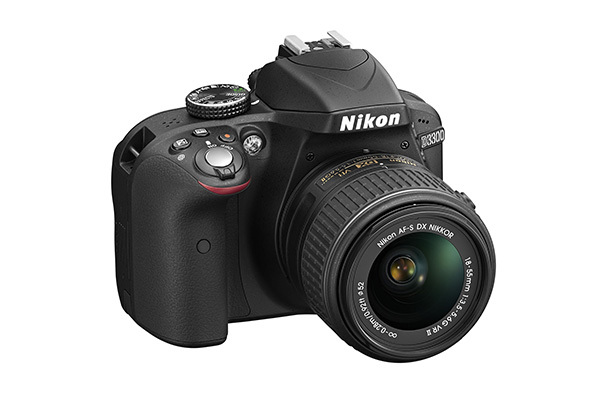 The D3300 is Nikon’s lightest ever DSLR, owing to its carbon fibre and monocoque construction. Build quality is excellent and the grippy rubber coating and deep handgrip make it very comfortable to hold. 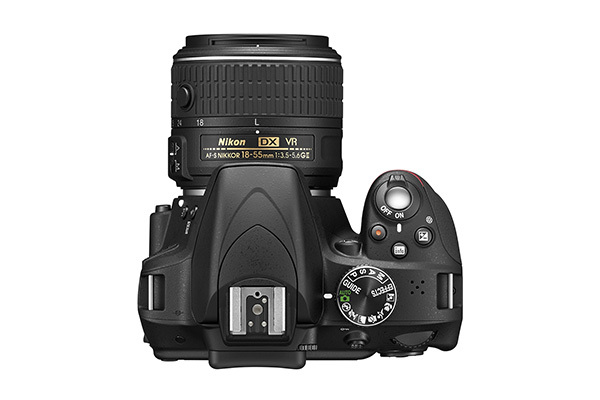 The button layout is near-identical to the D3200, so users upgrading from this model can expect to hit the ground running. There are several direct controls on the camera, as well as a thumb dial, though yet again Nikon has failed to add a dedicated ISO control, which is one of the most frequently changed settings. This means having to go into the Quick Menu to change ISO, or registering ISO control to the function button on the front of the camera. There is also no direct white balance control. Nikon’s menu system is excellent, with a pictorial representation of the three exposure variables on the main screen and easy to navigate options. There is also a Guide menu with advice, step-by-step instructions and basic in-camera retouching options such as cropping, miniature effect and various filters. The D3300 is available for £499 body-only or £599 with an 18-55mm f/3.5-5.6G VR II kit lens. An earlier version of this lens was available with the D3100 and D3200, but this newly designed model is an impressive 30% smaller and 25% lighter. The thinner barrel makes the lens easier to use, and the lens retracts to just 60mm when it’s not being used. A button on the lens barrel releases the lock mechanism, and must be pressed in order to fold the lens away or open it up before use. The camera cannot be used while the lens is in its retracted position. The new design makes it 17mm shorter than the previous design. Overall, this model is definitely an improvement, although remembering to extend the lens every time you turn the camera on takes some getting used to. When tested in-studio against our lens test charts we found the 18-55mm performed very well, with only minor optical imperfections. At 18mm, there is fairly minimal visible chromatic aberration in the corners, even at wider apertures, and near the image centre it’s non-existent. At the other end of the zoom range, there is no chromatic aberration, even at f/5.6. Image softness at the widest apertures is apparent in the corners, but is more significant at wider focal lengths. Barrel distortion is about average and there is no significant pincushion distortion. Images lack contrast and sharpness at the smallest aperture setting. Overall, we’re very impressed with this lens, and most users will only feel the need to upgrade should they want a wider maximum aperture for a shallower depth-of-field. We tested the D3300 both in-studio and in real-world shooting situations, and found it has excellent low light performance, producing images with virtually no digital noise right up to ISO 1600. At ISO 3200-6400, there is some colour noise visible, especially when zoomed in to around 200%, but images are still quite useable, and noise can successfully be removed with post-processing software. At the highest ISO setting of 12,800 noise is more of an issue, and is clearly visible when viewing the image full screen. Images are just about useable at smaller sizes if there is no alternative, but using a tripod or flash is recommended if available. The D3300 is a fantastic camera that we wouldn’t hesitate to recommended, despite a few handling gripes. It boasts the best spec of any entry-level DSLR on the market, with a 24.2MP resolution, Full HD 1080p 50fps video recording, and an EXPEED 4 processor. It also has exceptional low light performance and image quality. However, it’s very similar to the D3200, with only a few relatively minor tweaks to set them apart, the most significant of which is the newly-designed retractable kit lens. Therefore many will be tempted to save £130 by buying the D3200 kit instead. Or perhaps even smarter money would be with the enthusiast-level Canon 700D, which boasts a flip-out touchscreen, Wi-Fi, and, crucially, a lower price-tag. We’re likely to see the D3300 drop in price though, making it more attractive. Overall, the D3300 is an excellent all-round camera that is ideal for beginners wishing to try more advanced photography.